Active Referral is our 12-week programme of exercise, providing people in Jersey with support and guidance through their rehabilitation. It’s for islanders aged 16 or over with certain medical conditions or pre/post-surgery and is run by specially trained fitness instructors. 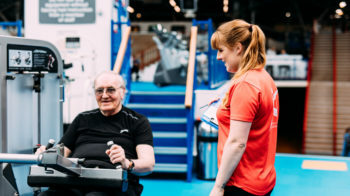 Participants are referred onto the scheme by either a doctor or health care professional, and then attend two sessions per week at one of four sports centres. For full details of the scheme, please click here for the information sheet. GPs and other health professionals please click here to refer a patient to the Active Referral programme. Existing clients and GPs/health professionals can log on to review data and information by clicking here. The below mobile numbers are only to be used to advise of non-attendance on the day of a session, or in emergency situations. All other contact regarding Active Referral, including to cancel an initial assessment, should be directed to the main Jersey Sport number: 01534 757700.